"Cutting lawns, sweeping floors—I've worked my whole life," a formerly-homeless veteran who's floated between industries since his family moved west in 1968 says. North Orange County vet Robert Benson is the latest individual to start GRID Alternatives Greater Los Angeles' Troops to Solar training, seeking rewarding new pathways for employment. The sixth of nine siblings born in Detroit, Robert met countless individuals over three years in the United States Marine Corps. As November 11 approaches, however, he anticipates making a few professional contacts in particular: GRID Solar Installation Supervisors, who will give him the means to learn construction hands-on by doing real work at sites throughout California's beach cities and Inland Orange County. As GRID GLA Executive Director Michael Kadish puts it, "Veterans like Mr. Benson deserve our support in their efforts to secure 21st-century careers, and we're glad GRID Alternatives is making that possible in partnership with our friends at Wells Fargo through the Troops to Solar initiative." 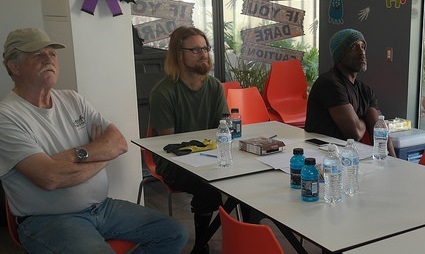 In October, GRID GLA came to Potter's Lane in Orange County to talk about lucrative opportunities for vets like Robert in clean energy, tap into their leadership potential and work ethic, and learn their stories. It's been a long road already. The Bensons lived humbly, and Robert enlisted as a Marine during the height of Vietnam. Sent to Twentynine Palms Base after boot camp and infantry training in San Diego, he spent the entirety of the early 1970s overseas: deploying to the Philippines, loading onto ships in Okinawa, coming ashore in Hong Kong, learning about Asia's industrial revolution in Taiwan. In 1972 Robert was assigned closer to the warzone: "I was over there [in Southeast Asia] in December of '72," he remembers. He was on the USS Tripoli, carrying its full capacity of helicopters—"like a mini aircarft carrier. We left Okinawa, went up to the Gulf of Tonkin and patrolled the gulf using old transistor radios. We were about two miles off the coast, and we stayed there for a long time and got a lot of liberty." But what he also got were manual and mechanical skills as a motor transport operator, a workforce education for vets of the era. He came back from deployment in the South Pacific with a new perspective. "The way that war ended was pretty bad for us. It was pretty bad for the people there, too," he recalls, feelings that weighed on him. But upon his return to the States, Robert made the best of the freedom that came with life as a civilian. He studied a year at Golden West College in Huntington Beach, trying out as a wrestler. He asked around among friends for anyone hiring. Robert settled into a working class job where he used his truck, transporting blood samples intended for medical use to and from the packing houses of the Inland Empire—"the nastiest jobs in the world, and I had the nastiest job in the packing house." As part of a pharmaceutical hiring boom in the postwar era, Robert benefitted from career mobility, accepting the training that he was given freely by laboratory technicians during at Irvine Scientific in South County. He even moved from a driver position to an in-the-lab role filtering the blood serum he collected; Robert took his skills and experience to an out-of-state business until a conflict with a bad partner left him robbed of his savings. Then – after what he calls "twenty-four stinkin' years!" – he hit a rough patch in life, struggling financially while he worked in an OC storage facility. As a participant in Troops to Solar, Robert Benson is now finding out he can benefit directly from Wells Fargo support that lets GRID help American veterans enter the solar industry. It starts with Wells' support for his residential facility itself: Robert was living in his van when he fortuitously received the opportunity to put a roof over his head at Potter's Lane, an American Family Housing space where chronically homeless vets can stay in recycled shipping containers converted to modularized apartments. He admits that "the guys he lives with" often face complicated webs of struggles, from disability to drug use. But in two years, Potter's Lane has been a stunning second chance, and he won't be wasting it: "I think I'm the oldest here, of the fifteen units, and we all came off the streets basically. But it makes so much sense; you just get to the people here." Veterans from the Potter's Lane project supported by Wells Fargo at their first solar introduction meeting. Marine veteran Robert Benson is on left. Robert understood exactly how special the stipended training GRID and Wells were offering could be for Potter's Lane vets, even for the majority who have little exposure to cutting-edge technologies. "There's no generals in here! No sergeants, no majors. But [that means] everybody here is lucky to be here" in Workforce Development. He says, "Most everyone here feels grateful, thankful to have the opportunity with Wells and AFH." Working with his hands for decades here in Orange County has taught Robert one thing: he has no use for people who don't want to work, and plenty of respect for anyone who can get vets hired. This November 11 is the second Veterans Day holiday when Robert will be able to tell his two daughters on the other side of the country about the security he has at Potter's Lane—and the first when he'll be able to tell them he's learning construction with Solar Installation Supervisors, alongside colleagues from his own community. It should be a priority for us to make sure that those who served America in uniform, as Robert did, get security and support no matter what stage they're at in life. With AFH partners like GRID Alternatives and Wells Fargo, Robert is positioned to be a success. That will come with self-esteem. "It takes a village to raise the next child. It takes the grandpa," he repeats. "It takes the grandma. Let's be thankful to have the opportunity!"